Zurich, Switzerland – The Swiss digital health company dacadoo launches its newest version of the geolocation walking game dacadoo GO, accessible via mobile apps for iPhone and Android smartphones. dacadoo is a global healthtech and insurtech company that is driving the digital transformation in healthcare. It develops and operates the award - winning dacadoo health engagement platform that helps individuals actively manage and improve their health in an easy and fun way. To encourage users to remain active and healthy, the company applies motivational techniques from online games, collaborative features from social networks, A.I. - and rule - based automatic feedback along with the patented dacadoo Health Score to better understand and improve their health. 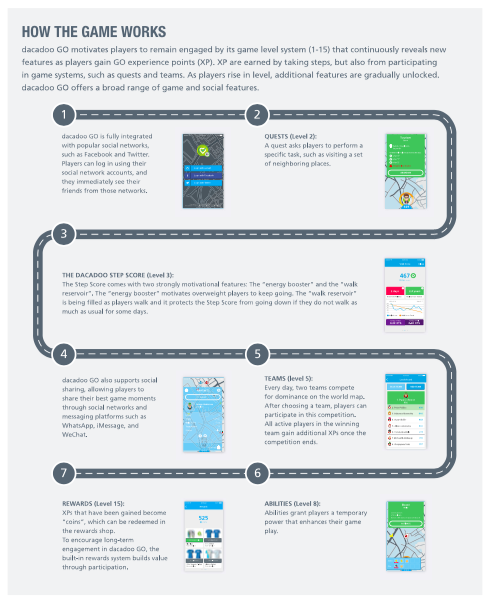 In addition to the holistic health engagement platform, dacadoo launched a geolocation walking game last year. dacadoo GO is accessible via mobile apps for iPhone and Android smartphones and is offered to enterprise partners globally who are looking for a market entry product focused around walking, as well as directly to end users. Please find attached an infographic explaining how dacadoo GO works. Facebook and Twitter support for login and playing with friends: Players can use their existing Facebook and Twitter accounts to log into dacadoo GO. Content sharing: Players can share their avatar, daily steps, level, Walk Score, accomplishments, location and standing of the team battle on any sharing - enabled app including WhatsApp, Facebook and Twitter. Each player is in full control of what he or she is sharing. Improved map with compass and street names: A compass and street names have been added to enhance the utility of the map. Walking statistics: The walking statistics compare the steps taken by the player with other players in the same city, country, or Walk Score range, providing the user with a personal benchmark. Branding: dacadoo GO is now fully brandable for dacadoo enterprise clients. “dacadoo GO is targeted at younger user populations such as generation X and Y but can of course be played by users of all age groups. Version 1.1 contains not only multiple improvements on existing features and usability based on user feedback but also introduces new features which will help increase our user engagement!